Since appearing on From the Top, Taeguk has won several top honors including first prize in the Pablo Casals International Cello Competition in 2014, as well as the Janos Starker Foundation Award of $25,000 in 2016! Taeguk Mun has appeared as a member of the Maggiore Trio on Show 174 recorded in Boston, MA at age 13, Show 223 recorded in Abilene, TX at age 16, as well as on Show 260 recording in Troy, NY at age 18. 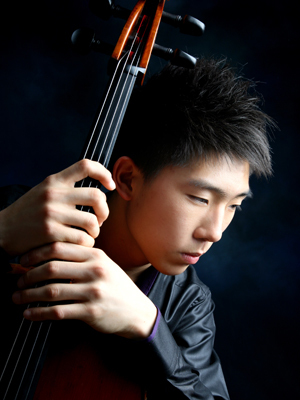 Taeguk Mun (cello), 18 is from South Korea where he began studying at the age of four. A freshman at New England Conservatory in Boston, Massachusetts, he studies with Laurence Lesser. He has been featured on From the Top as a soloist in 2010, and as part of the Maggiore Trio from the Juilliard Pre-College Division in 2008. In December of 2011, he was the winner of the Third Andre Navarra International Cello Competition. Taeguk is a Jack Kent Cooke Young Artist.